I prepared our Hummingbird feeder at the very beginning of March since we were having such spring-like weather. I knew it was too early, but with it being so warm, I thought perhaps the Hummingbirds hadn’t gotten the same memo they do about when to fly to San Antonio. I wanted to be sure that everything was ready for the little fellows. I knew they had traveled quite a distance to get here. 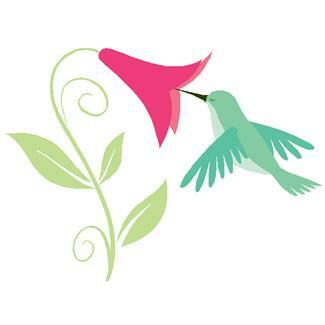 This past Thursday, I bought two red hanging geraniums to catch the attention of the Hummingbirds and then I cleaned and re-fueled the Hummingbird feeder. I don’t know why I chose Thursday, it just felt like the right day to (again) get ready for the Hummingbirds. Within hours, our first Hummingbird arrived. As I said, I just checked my calendar to see when Spring will arrive this year. Imagine my surprise when I saw that Spring sprang last Thursday. It appears like that little, tiny Hummingbird knew a whole lot more than I did! Hope you ALL have wonderful Spring times! So I will wish you “Happy Time Between” cause that’s what we are stuck in, it seems. Just a note to all Amazon/Kindle buyers.They just settled a lawsuit with some publishers.You could be entitled to a credit on your Amazon account. Keep an eye opened for an e-mail from Amazon. I got $33 , so it’s a nice surprise for me! Mel, I got a letter from Amazon saying I have a credit, too. Yahoo! I also got a notice from B&N about a settlement but I didn’t check to see how much. I like surprises! Lol. About spring, happy I don’t live in Maine. They were calling for a foot of snow there. It’s about 19 degrees here in Pa. and we just had what we call our onion snow. Just a dusting. Spring? We had some snow yesterday – JUST a reminder that March isn’t done yet! I have a bad cold with a wicked cough and low grade temp. and stayed home yesterday. I thought perhaps I could spend the time lazily reading. But as I lay in bed (attempting to read), I slept all day instead. Bummer! MJ, a whole day of sleep doesn’t sounds all that bad! Although, the cold/cough/temperature that accompanied your restful day doesn’t sounds so great. Hope you are feeling better. I just received a pleasant surprise from B&N a rebate check for about $47 from that lawsuit that was just settled. Four of my favorite authors have new book coming out now and in April. Mary Daheim, Susan Wittig Albert, Ann Purser, and Nancy Atherton so you can see where my money will be going. WE just missed being slammed by the blizzard that is hitting Cape Cod, but the winds are howling outside right now. Ah Springtime in New England. AS the old saying goes, “Don’t cast off the clout until May is out”. Regina, looks like you know exactly what you are going to be doing with your publishers’ rebate. Those of us who live in the Sierras have a different perspective on this year’s spring. Our 3 year drought has brought on many rain dances. To our delight, we are pleased to see the storms a-comin’. We are looking at what used to be our usual winter fare of a storm every 3 days in the mountains. Those storms produce the huge snow pack, that will eventually melt, and head down aqueduct to the fine people of Los Angeles. We are sitting at 30 – 50 % of normal. Everything is dry. Praises for our storms! Spring isn’t in the Cleveland area yet, had measurable snow fall last night. I don’t know if spring will ever get here!!!!!! Mary, as bad as your weather sounds, it will all be worth it when the tulips and daffodils start popping up. My husband comes from Northfield, and it is so beautiful up there. Spring hasn’t come to our section of Ohio either. We have had a couple of nice spring type days but these 2 days weren’t in a row. It is actually raining with a few snowflakes thrown in. It is very windy and just gloomy today. We need the rain though. Things are very dry. I feel terrible for those poor people who were caught in the mudslide in Washington State. Linda C, that really was awful. The weathermen are predicting 6-12 inches of snow tomorrow (Saturday). I sure hope they’re wrong. This is the winter that never stopped!!!! Mary, I know I say this all the time, but it is so difficult for me to grasp the idea that people are getting snow while we are enjoying days in the upper 60s to mid 80s. Of course, your summers must be a lot more pleasant than our close to 100 degree days, with so much humidity you would think you’re living in Panama. Danna, we don’t have many 100 degrees days in the summer but we have a lot of high humidity. Right now as I type this we are getting clobbered with snow!!! And next week it’s supposed to be in the 50s-60s. Crazy. Mary, it sounds like you get the worst of both ends of the weather spectrum. One year, when we were visiting my husband’s family in Northfield, Ohio, their air conditioner went on the brink. Yow! We quickly purchased a kiddie pool for our two children so that at least they would get some relief. Here in North Carolina it is sunny and 70 one day, 30 and snowy the next. That’s just a typical spring in these parts. The weather usually settles into a comfortable routine around the end of April. In the meantime, our poor little robins seem to be very, very confused. I hope they don’t give up on NC and fly further south! In Kansas City the saying is, “If you don’t like the weather, wait a minute.” It’s especially true in the springtime. Tonight it’s supposed to be below freezing. Saturday it will be in the 70’s. The weather will ricochet like that until June. Outside my window right now the north wind is blowing the trees sideways. My hummingbird feeder is sitting outside on the deck ready to be filled and hung up on Sunday. Can’t wait for the first birds to appear! Joyce Ann, I don’t know if it’s because we finally did something pro-active about attracting Hummingbirds, or if it’s something else, but in the past, we have only gotten one rather dominate bully Hummingbird who doesn’t allow any other Hummingbirds at “his” feeder. However, yesterday I saw four at the feeder at the same time. I can’t believe how excited I was to see that. I love your blog. Thank you for taking the time to maintain this site. It s my go to place to discover new authors and to check up on what’s new with old favorites. It just gets better and better! Diane, I am glade you are enjoying the Cozy Mystery site, and the blog area. Danna, We got quite a lot of rain in my part of Ohio today and more is expected this weekend.. There are flood warnings out. It has been rather dry around here and we do need the rain. But we could do without the flooding. We have had quite a few floods off and on in this area all winter long. What a winter!! Linda C, sounds pretty crazy. No rain and then floods. Take care!